James lives in Southbury with his wife, Lynn, and their children, James, and Chloe. 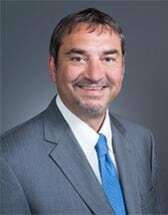 He enjoys skiing and fishing in his spare time, and is actively involved in local civil affairs in his hometown of Southbury and the greater Waterbury area. A 1980 graduate of Ridgefield High School, he went on to Rollins College with a double major in Economics and Business. He then attended Law School at the University of the Pacific in California and received his JD. After law school, his studies continued at the University of Salzburg, Austria where he obtained a degree in International Business Law before returning to the University of the Pacific to complete his LLM (Masters) degree in International Tax Law. James, an Eagle Scout, is a volunteer with Southbury Boy Scout Troop 162 as a Committee member, and is the founder and CEO of Friends of Troop 162 Inc., a 501c3 organization formed to assist in the funding of community service projects. He is a former Committee member of Waterbury Youth Services Inc, a 501c3 organization committed to helping inner city youth. His wife Lynn also volunteers as head of the Advancement Committee for Troop 162, and is active in the PAC swim team.